Getting around is a challenge that a lot of our clients face but the reality is that there is no ‘one size fits all’ solution. For some clients, mobility scooters are the correct choice and for others, they’re not. A wheelchair may be more appropriate but when it comes to wheelchairs, there’s a whole range of different options available. When are powerchairs the right choice? They can be known as ‘electric’ or ‘powered’ wheelchairs, and they’re ideal for clients who perhaps don’t have the strength and stamina to use a self-propelled wheelchair but don’t want to rely on being pushed. How long will the client be out in the chair? Before choosing a chair, it’s vital that you ensure that it’s going to be comfortable enough for long journeys. Lots of chairs may appear to be comfortable when a client first sits on them but it’s important for our clients to test what the chair will be like on an ongoing basis. 20 minutes is the minimum amount of time ideally to test the chair. Does it fit in the car and can it go on holidays? Pretty much all powerchairs fold so it’s usually relatively easy to get one in a car but when working with clients, it’s well worth considering which vehicle the chair will go in and how much space it will take up when being transported. Because of the motor, generally the frame will be heavier than a standard wheelchair. What do they need the chair for? Is it for popping around the corner or doing the shopping? The answer to this question will inform the type of chair a client will choose, whether indoor, outdoor or a hybrid. Similarly, if they’re out and about, then it’s worth bearing in mind that there’s a large selection of wheelchair specific accessories designed to improve the client’s experience. Most ‘drive controls’ for wheelchairs are essentially joysticks mounted on one of the armrests. These can take a while to get used to, and may be over/under sensitive, so it’s vital to ensure they’re right for our clients and that they are used to the level of sensitivity. Storage is important – it needs to fit comfortably in the client’s home, and – ideally – stored near a socket, allowing for overnight charging. Some outdoor wheelchairs may not fit in a home, and as such, will need a garage or another outbuilding to house them. Is the client looking to travel on public roads? There are two types of power wheelchairs: Class 2, which can be used on pavements and Class 3, which can be used on roads as well as pavement. Are there any kerbs or obstructions on usual journeys? Larger wheeled chairs are best in this scenario, as well as purpose-built chairs designed to overcome kerbs and obstructions. Will the chair be used around the home? If so, the client may be eligible to apply for a Disabled Facilities Grant to adapt the home for ramped access and widened doorways. Consider future deterioration too, will a through floor lift be required one day? If so, the wheelchair will need to fit into it. Does it work ‘off the rack’? Usually, wheelchair manufacturers are pretty flexible which means that there’s a good chance that there’s room for manoeuvre and customisation. Generally speaking, an OT can safely assume that a client will be able to have a customised level of cushioning, seat size and length, as well as footplate & armrest height and position. Some powerchairs allow clients to buy a headrest as an optional extra, as well as storage bags designed to fit somewhere on the chair. If a client is planning to use their chair on public highways, then they must abide by the specific section of the Highway Code that deals with powered wheelchairs and mobility scooters. 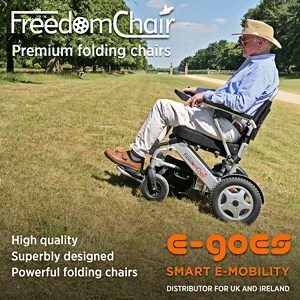 A client may be able to secure funding to help finance the purchase, or part of the purchase, of a powered chair. Typically, the funding is released on a means-tested basis and on the basis of a GP referral, with the money being provided through the local NHS trust. The best first step for the client is to speak to their GP and get the ball rolling. If a client is seeking to purchase or rent a powerchair, often the first point of call is the Motability Scheme, enabling disabled people to lease a new scooter, powered wheelchair or car by exchanging their mobility allowance. There are over 700 WAV vehicles listed to help clients choose a vehicle that will support them and their wheelchair. Ableworld also enables clients to click and collect on their website but when a client collects, they will need to work with the staff to assess needs and ensure that the powerchair chosen actually meets the client’s needs. Having stores all over the UK, Ableworld is a great option to start with. Calling Wheelchair Suppliers! As you know, we run OTAC events, and we’d love to help our occupational therapists understand more about choosing the right chair. If you think you can help, drop me a line at stuart@promoting-independence.co.uk. When it comes to powerchairs, there’s a huge amount of choice, so it’s worth thinking carefully about why it’s needed and what it’s going to be used for. Indoor/Portable: These chairs can be used in a home or in places with smooth flooring, like indoor retail outlets. If the chair is going to be used in multiple locations, it’s important to ensure that it’s easy to fold, so it can be transported. Outdoor: Generally speaking, these chairs possess bigger wheels which help them to deal with variable ground and some of them feature suspension, which makes the ride more comfortable. Although they are typically designed to be used outdoors, it’s worth bearing in mind that because they’re bigger and sturdier than indoor chairs, they won’t always fit through doorways. Indoor/Outdoor: These chairs are hybrids, that offer a balance between both the indoor chairs and the outdoor chairs.